Combination packages deliver limited time savings up to $5267. When it is time to purchase a lab bench top centrifuge, the best option for preserving budget dollars may be centrifuge bundles. These convenient packages combine Heraeus centrifuges with the necessary components so that customers can complete their purchase with one order—and benefit from the combined savings. Cole-Parmer offers a full range of bundles based on customer applications, including cell biology, tissue culture, clinical work, or basic fluid separation. Each centrifuge features the glove-friendly ClickSeal® biocontainment sealing system, which eliminates the use of screw caps and clips and reduces contamination. A proprietary secure locking system enables users to exchange rotors in seconds with the push of a button. Carbon fiber rotors are lightweight for breakthrough G-force/rpm performance with an industry-leading 15-year warranty. 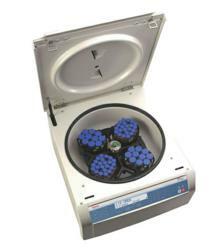 Select from various sizes, capacities, and styles, including refrigerated centrifuges and nonrefrigerated options. The Multifuge series works well for research-focused uses while the Megafuge series is ideal for clinical and routine applications. Bundles offered include Microplate Centrifuge Bundles, Tissue Culture Centrifuge Bundles, Clinical Centrifuge Bundles, or Carbon Fiber Centrifuge Bundles. For more information, call 800-323-4340 or visit ColeParmer.com/19366. Cole-Parmer has been a leading global source of laboratory and industrial fluid handling products, instrumentation, equipment, and supplies since 1955. Our product lines, including popular brand names such as Masterflex®, Oakton®, and more, are sold through company-owned customer channel outlets and a strong network of international dealers. We also feature an ISO-17025-accredited metrology lab for instrument calibration and repair. Cole-Parmer responds with excellence to customer needs, and offers application expertise and technical support. For more information, contact Cole-Parmer, 625 East Bunker Court, Vernon Hills, IL 60061. In the US, call 800-323-4340. International customers, call 847-549-7600. Visit us at http://www.coleparmer.com.